This was a multi-disciplinary conference to demonstrate the work taking place across Surrey, Sussex and Kent & Medway for the Armed Forces Community. 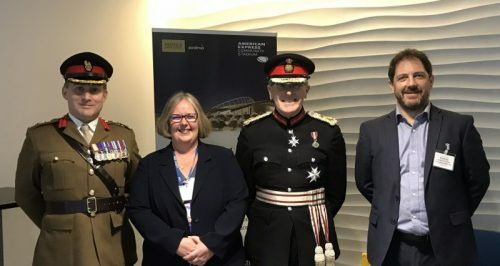 The event showcased what has been happening across the patch to break down the barriers between organisations and highlight the achievements to meet the Armed Forces Covenant. The Lord Lieutenant for East Sussex was in attendance and alongside Colonel Ian Adkins, Deputy Commander for the Reserves 11 Infantry Brigade, presented Awards to Service Champions across Sussex and Kent & Medway in recognition of their work with the armed forces community. Featured left are Colonel Ian Adkins, Kate Parkin, Lord Lieutenant for East Sussex Peter Field and Dr Nick Lake. Featured above is the Margate Taskforce accepting the Team Award from the Lord Lieutenant for East Sussex. It is planned to repeat the conference in 2019 on Tuesday 22 January 2019.